Why Use A Patch Panel? When we set up a network, we are accustomed to buying a patch panel as usual. And people always say they buy patch panels for cable management, as they are asked why use a patch panel. However, are there any other benefits of a patch panel? Yes, of course, here explains why use a patch panel in networking. Figure 1: Patch panels in a rack for managing the fiber and copper cables. As shown in the picture above, patch panels are usually attached in the network racks. All the cables from the individual desktop, computer or printer go to the patch panel. 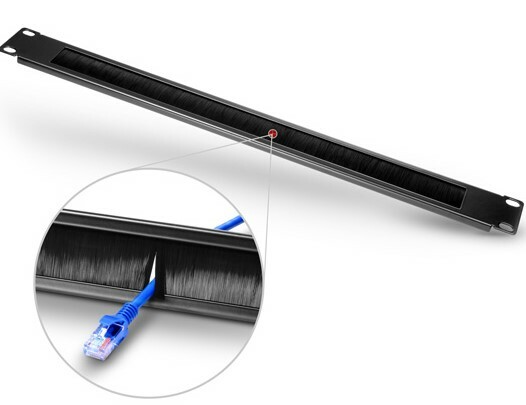 Then the patch panel provides a protection and management for the cables, which contributes to ensure the cables’ performance in the whole network. This is the greatest benefit of using a patch panel. Whenever cables change direction, the bend of the cables is likely to change the electrical properties. If one cable bends too far, unfortunately, damages may occur inside where you can’t see it. So patch panels can help to protect the delicate cables. Besides, using a patch panel improves working efficiency and workflow. How? For example, telecommunication and cable companies always use patch panels in strategic locations in their coverage areas. Therefore, the technicians can connect or disconnect services to the specific places without going to the actual locations just by managing the patch panels. Finally, using a patch panel also improves the aesthetics of your work area. All cables are in place and accessible represent a well managed workstation, which also shows your professional quality. Why Not Use A Switch Instead of Patch Panel? When someone connects the cables, he may wonder why use a patch panel is a requirement and why they aren’t connected to network switches directly. The answer is that patch panel and switch play different roles in the cabling system. Patch panel acts just as a connector which will not make any influences on data transmission, but a network switch connects hardware within a network to enable them to access the Internet, share data etc. In a data center rack, there are many network switches with numbers of ports. Routing cables from one rack to another is a tough job. So you have to use patch panels to manage these cables. Designed for specific cables like Cat5e, Cat6 copper cables and OS2, OM3 fiber cables, patch panels types are different. This type of patch panel takes the simplex, duplex and quad model designs at FS.COM. There are 24 port patch panel and 48 port patch panel available for you to choose. All products are produced strictly in accordance with national standards. The following is a 24 port LC duplex fiber optic patch panel used to connect 48 OS2 single mode fibers. It uses the standardized jack that makes it easy to insert and remove fiber cables, so that to ensure the long-term and stable performance of the fiber cables. FS.COM offers punch down and feed-through Ethernet patch panel. And the feed-through patch panel falls into unshielded and shielded types to wire the unshielded and shielded Ethernet cables. The following is a 24 port Cat6 unshielded feed-through patch panel. Design with SPCC and ABS plastics materials, the Ethernet patch panel is sturdy and durable that can work in the environment of -25°C to 70°C. 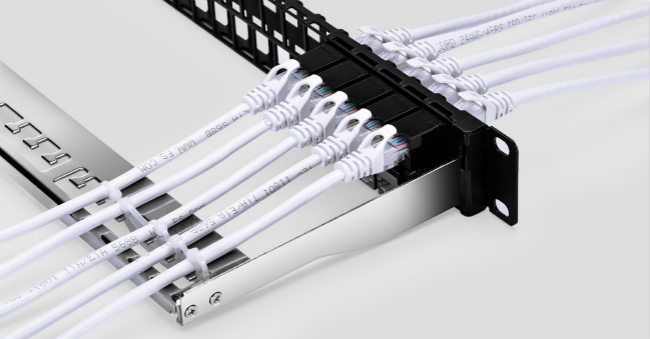 When you are unable to decide in advance which type of cables will be used to connect your hardware, you can use a blank keystone patch panel. The following is a 48 port blank keystone patch panel that provides flexibility in the type of jacks. As a result, you can make a mixed connection based on your actual demands. Figure 4: Cables connected on 48 port blank keystone patch panel. What is the purpose of patch panel in networking, or why use a patch panel? I think now you have a good understanding. 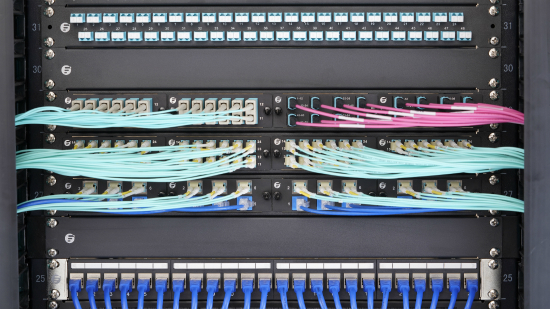 Today’s fast changing technology makes more and more electrical and electronic devices connected to each other, so don’t hesitate to use a patch panel to simplify the cabling.